Why Parenting by connection is a different program? To bond with your child even when you are very stressed and can't bare him even when he is crying and whining for hours and hours. Let your kid trust so he can listen to you and trust your advice. Let your kid feel close to you and safe with you so he can come and share with you his issues without you even ask him. The classes doesn't support you to raise your kid positively, but it help you as a parent to relief your stress and feel empowered and motivated parent. If you know all the parenting science in the world and you feel down, stressed parent you won't be able to even remember any thing you learned to apply it. 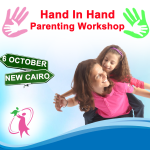 Hand in Hand is a transformation parenting program. It doesn't only help you to change your behavior with your children but it changes your way of thinking, your parenting mindset. It helps you to understand yourself as parent and the underline reasons of your behavior to be able to improve it . It helped you to understand your child behavior problems which will make a huge difference in the way you react to him. The tools provided work on the underline reason of your child ,it doesn't work on a temporary solution to stop child bad behavior , that s why the tools impact is very effective on the long run too. It doesn't only help you to stop children behavior problem but it improves children thinking capabilities let him understand so not to repeat same problem again and again. The tools offered are already proven over 40 years by research and studies. The results showed big impact on solving kids problems and on the development of their personality. I already applied these tools myself ,in order to get certified I practised these tools in 25 cases with different children of different ages. Also parents who already took the classes with me have noticed big change with their children . Are you ready for the change!